As the press focuses on TV debates - and Young Dave’s attempt to chicken out of them - this gives them a good excuse not to let their readers know that the sham press regulator most of them signed up for has suffered a serious blow this week. 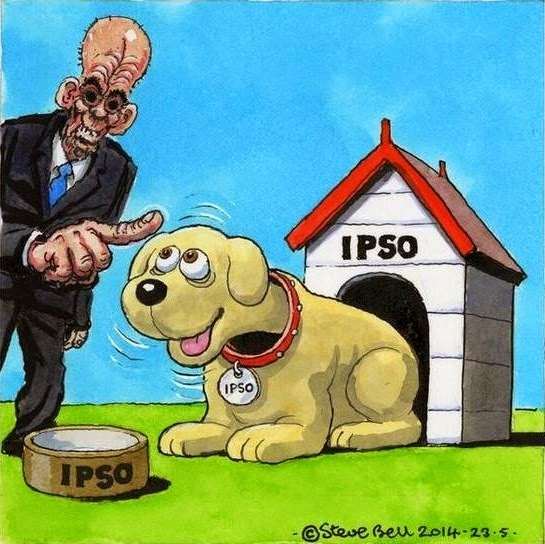 And that regulator, the so-called Independent Press Standards Organisation (IPSO), which is not independent at all, has been dealt that blow by its mortal enemy. The body that, in effect, exercises control of IPSO, the Regulatory Funding Council (RFC), was put under pressure this week in the light of revelations over past behaviour at the Mirror titles. This is because the RFC was chaired by one Paul Vickers, who had spent 22 years at the Mirror organisation, latterly as its legal director. So he had been in post when all the misbehaviour had been taking place. This was, more or less, telling all those who have had their privacy abused in order to facilitate More And Bigger Stories For Mirror Hacks Personally Now that they could go and take a running jump. It was bad, even by the pitifully low standards of the not-at-all-lamented PCC. As a result, those at campaigning group Hacked Off were not backward in coming forward and suggesting that Vickers should resign. While Vickers “told the House of Lords communications committee on press regulation that he was aware of the phone-hacking complaints made against the newspaper group while he was drawing up plans to govern the industry, but denied any suggestion of a conflict of interest”, Evan Harris was having none of it. “Only newspaper corporations which care nothing about the damage done to the innocent victims of the criminal abuse in their industry, and even less about the cover-ups or codes of silence which they have been engaged in, could think it acceptable for the body which controls the budget and the rules of the press regulator to have Paul Vickers at its head … Ipso would have little credibility even if Mother Teresa were in charge of pulling its strings. Instead, it has got Paul Vickers – the face of corporate denial of widespread criminal activity” concluded Harris. Or, to put it more succinctly, Ouch! So what were Vickers and IPSO going to say to that, then? Actually, they were going to more or less agree, and the former Mirror legal director, who carried out a Really Thorough Investigation That Just Happened To Find No Hacking At All Honestly Even Though It Had Been Happening On An Industrial Scale, said “Righto” and resigned. Yesterday afternoon, he said “Having devoted a huge amount of my time to setting up Ipso, I do not want my position to be used by its enemies and the enemies of a robust free press as a weapon with which to beat it … I have therefore told the board of the RFC [Regulatory Funding Company] that I have brought forward my departure date and resigned as director and chairman with immediate effect”. You see, he was going to go in May anyway! Rubbish. He would have carried on, had nobody said anything. I make that another scalp to Hacked Off. So that’s another edition of What You Will Not Read In The Papers. Except for the deeply subversive Guardian.